Why hire a Morgan 4 seater? Hire a four seater Morgan car and you can take the family with you on a terrific classic car driving experience. So they (or your friends) can have all the fun of classic car motoring too! Our Morgan’s cheerful sunset yellow colour makes everyone smile and adds to the fun of the occasion. Based in the heart of the county we are ideally located for Morgan car hire Cheshire. 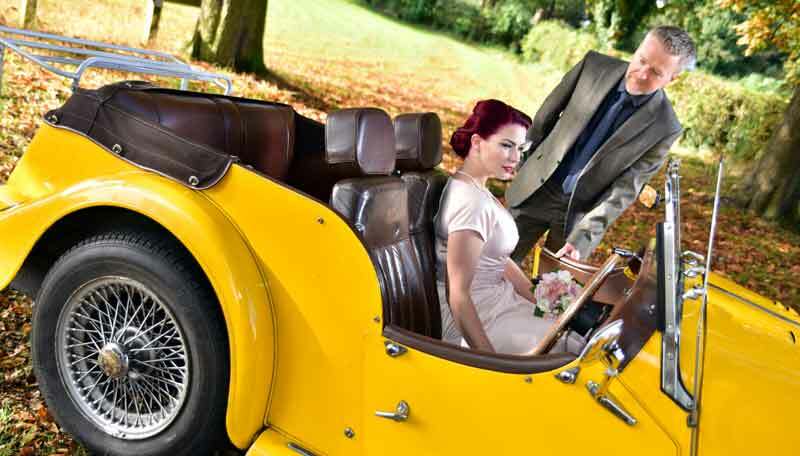 Get close to nature driving through the beautiful Cheshire countryside, enjoying vintage style motoring at its best. Or head off to the Derbyshire Peak District or the North Wales coast, both within easy reach. Or, with our pick up point being close to the M6, you can easily collect the car on your way to the Lake District. 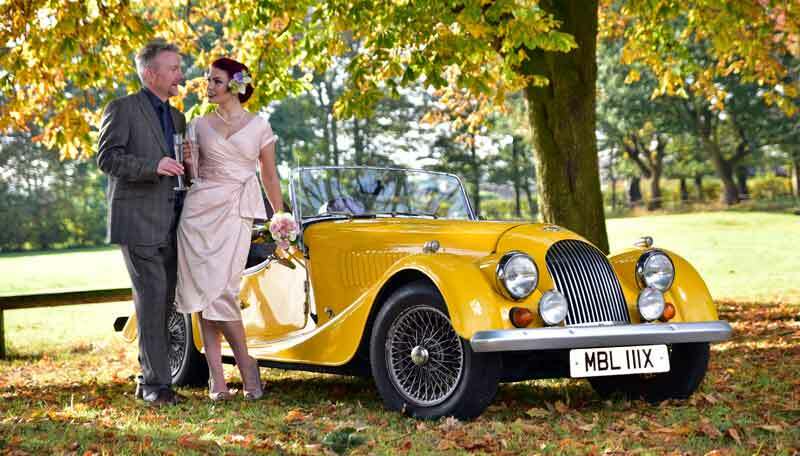 Our Morgan, with its vintage looks, is also a perfect choice for self drive wedding car hire in Cheshire. Hire a four seater Morgan car and you can take the family with you on a terrific Morgan driving experience. 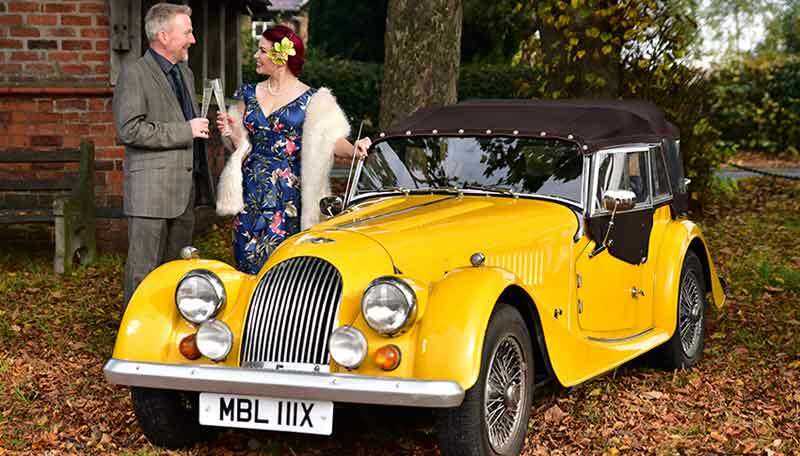 Our Morgan, with its vintage looks, is also a perfect choice for self drive wedding car hire in Cheshire. 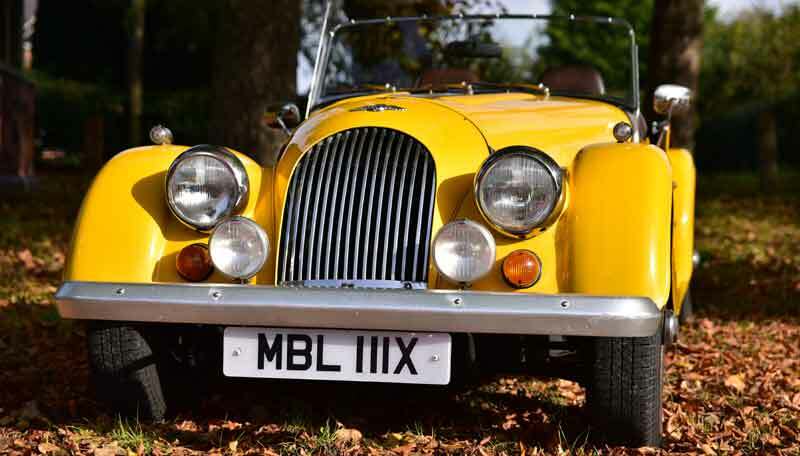 Our 1981 Morgan 4/4 for hire in Cheshire has the look of a real vintage car. Nicknamed ‘Mabel’ because of her number plate, she has four seats, brown leather upholstery and a lovely burr walnut dashboard. The hood is in dark brown mohair and there is a matching tonneau cover. The car has wire wheels, and a boot rack for luggage. With only two people on board you can also use the back seats for your bags. The Morgan has a 1.6 litre engine and four speed manual gearbox. Hire a Morgan for a day, a weekend or a short break. It makes an ideal gift for someone special, or a beautiful classic wedding car or prom car. If you’re thinking of buying a Morgan, why not try ours for a day to see whether you like it. Liverpool, Manchester, Chester and Staffordshire are all within easy reach for Morgan car hire Cheshire. The Morgan four-Seater is known as a ‘Tourer’, a touring car being an open car seating four or more. A four seater Morgan was first produced by the Morgan factory in 1937. 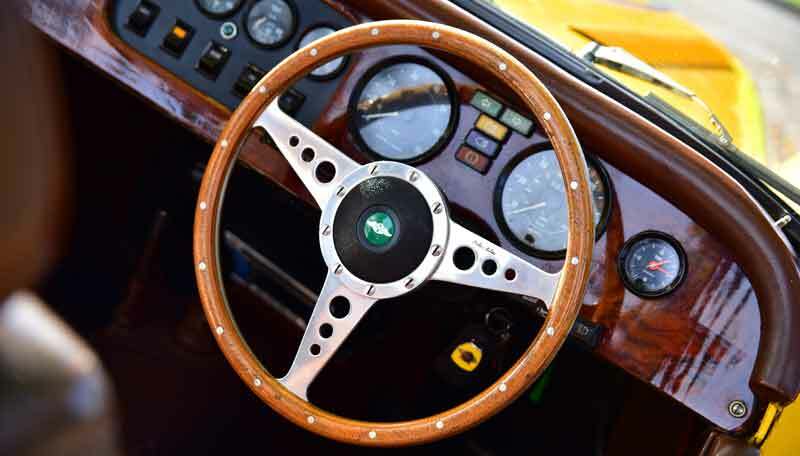 The 4/4 1600, the model of our Morgan, was first produced in 1969 and is still being manufactured today. According to ‘Wikipedia’ only about 50 four-seaters are built per year. Find out more about the history of Morgan cars. Disc brakes on the front, drum brakes on the rear. Morgans don’t have boots, but ours has a boot rack for suitcases. If there are only two people in the car rather than four, there is additional space for luggage on the back seat. Bright yellow with brown leather upholstery. Manual hood with side screens. .
Our Morgan hire car is available for collection near Northwich, Cheshire, not far from the M6. Our location is within easy reach of all the major towns and cities in the north west of England. We are in a prime location for Morgan car hire Stoke on Trent, Warrington, Chester, Crewe, Runcorn and Macclesfield. For Morgan car hire Manchester, and Liverpool you don’t have too far to travel either. We are within an hour’s drive of most of the towns in Lancashire via the M62. Once you’ve collected it you can drive our Morgan hire car anywhere in the UK subject to our terms and conditions. The All Day option is ideal for those who want a tour of the Derbyshire Peak District or the North Wales coast. The generous mileage limit of 200 miles will even get you to and from Anglesey and the Snowdonia National Park. The majority of people do around 170 miles when they hire a car for 1 day, and don’t incur excess mileage charges. The weekend option lets you take a relaxing weekend, with enough miles included to stay in either the Derbyshire Peak District, Snowdonia National Park, North Wales coast or the Lake District.